Raffaele Russo, 60, his 25-year-old son Antonio, and his nephew, Vincenzo Cimmino, 29, disappeared on January 31 in Tecalitlán, in the western state of Jalisco. The state’s governor said the officers had confessed to handing the Italians over to a local criminal gang. The police had allegedly arrested them at a petrol station beforehand. Raffaele Russo, 60, his 25-year-old son Antonio, and his nephew, Vincenzo Cimmino, 29, had stopped at a petrol station in Tecalitlán, an agricultural town. 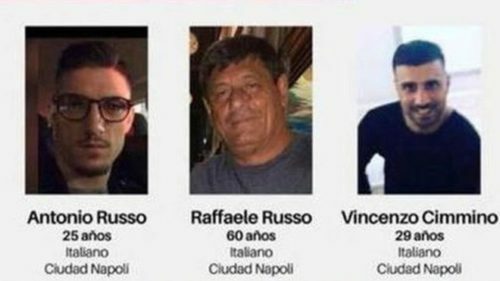 The last relatives back in Italy heard from them was a Whatsapp message from Mr Russo saying they had been approached by police officers who arrived on cycles and in a van. The police told them to follow them, according to the message. The son of one of the disappeared earlier told Italian radio that the men had been “sold to a gang for €43” ($53; £38), but regional officials said they could not confirm that information. Four police, including a female officer, have been detained and charged. The Mexican authorities say three more police are being sought in connection with the disappearance. Following the trio’s disappearance, the town’s entire police force was sent for retraining, although some local media speculated that they were sent away so that they could not be intimidated by local cartel members into changing their story. As you may recall, the state prosecutor in the 43 missing Iguala student teachers alleges that they were handed by local police to a criminal gang, who killed them and burned their bodies. The CJNG is expanding its presence and influence throughout Mexico. In each of the states where the group operates, it continues to successfully exploit its defining features: the flexibility to combine a military perspective with its historical criminal ties, a strategic commitment to become involved in pre-existing conflicts, and the promotion of vigilante rhetoric through propaganda. Filed Under: crime, drugs, Fausta's blog, Mexico Tagged With: CJNG Cartel Jalisco Nueva Generación, Nemesio Oseguera Cervantes aka “El Mencho"
Rafael Márquez among individuals linked by Treasury Department to drug kingpin Raúl Flores Hernández of the two main Mexican drug cartels, the Sinaloa Cartel and the New Generation Jalisco Cartel. The sanctions are a blow to the image of Mexican soccer. It is also a sign of how deeply drug-trafficking has permeated Mexico’s civil society, from politics to culture and sports, analysts say. Mexican singer Julio César Alvarez, known as Julión, was also sanctioned Wednesday for acting as a frontman of Mr. Flores. The sanctions freeze all U.S. assets of the people and entities named and forbid U.S. citizens from doing business with them. It also strips Mr. Marquez, 38, of his U.S. visa, meaning he can no longer travel to the U.S. to play games with the Mexican national soccer team. The sanctions don’t necessarily imply criminal prosecution. In the largest Kingpin Act action so far, the Treasury Department’s Office of Foreign Assets Control sanctioned a total of nine firms and 21 people for ties to alleged trafficker Raúl Flores Hernández and his organization. 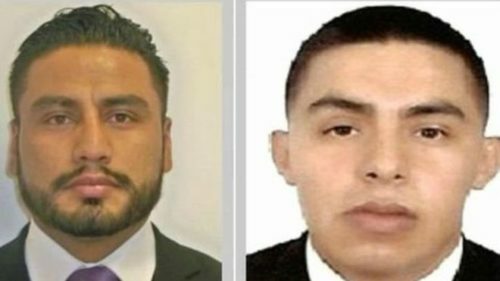 Mexico: Jalisco New Generation CJNG cartel expands into U.S.
American officials are reporting that the Jalisco Cartel – New Generation (CJNG) has expanded its trafficking operations in the United States, marking an important evolution in the modus operandi of the growing criminal organization. As reported by Proceso, the CJNG has used its growing presence in Juárez to boost its participation in US markets for cocaine and heroin. This marks a change in direction for the group whose prominence in Mexico has risen sharply over the past five years, but whose international forays seemed to be mostly limited to trafficking to Europe. The Proceso report squares with other recent indications from US authorities. In its 2016 National Drug Threat Assessment, published in November, the Drug Enforcement Administration (DEA) reported that the CJNG was one of the six Mexican organizations with the greatest presence in the United States. It has set up distribution hubs in Los Angeles and Atlanta, and also operates in far-flung cities such as Miami, San Antonio, San Francisco, and even Roanoke, Virginia. The most recent assessment reflects an increased presence relative to prior DEA reports. CJNG was founded in 2010 as an offshoot of the Sinaloa Cartel, distributing cocaine in Europe and, as InSight Crime points out, has a substantial operation in Asia. In other Mexican cartel news, the manhunt for Gulf Cartel leader Julián “El Toro” (The Bull) Loisa Salinas has created infighting within the organization, leaving nine dead so far. Jalisco state prosecutor Eduardo Almaguer said forensic evidence, footage from security cameras as well as interviews with witnesses convinced authorities that Jesús Alfredo Guzmán, 29, was seized by armed gunmen early Monday as he dined in an upscale restaurant in the resort city. Mr. Almaguer said investigators believe the abduction was the work of the Jalisco New Generation cartel, an up-and-coming gang increasingly challenging Mr. Guzman’s once dominant Sinaloa cartel. Unofficial sources claim that another of El Chapo’s sons, Iván Archivaldo Guzmán, el Chapito, was kidnapped, too. Serían Alfredo e Iván Archivaldo, los dos hijos de #ElChapoGuzmán, quienes fueron levantados en #LaLeche de #PuertoVallarta, #Jalisco. However, Héctor De Mauleón, writing for El Universal, denies the claim that El Chapito was there, even when El Chapito’s birthday is on August 15, coinciding with the date of the kidnapping during a birthday party at La Leche. De Mauleón questions why the kidnapped men went out apparently unarmed and with no bodyguards. Only one thing is clear: There’s a drug war on.